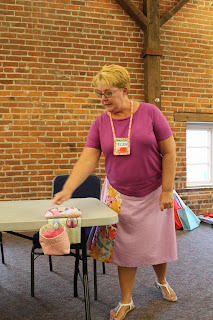 Christine made a fabric bucket from the free tutorial on Whipstitch. She used decorator-weight fabric on the outside and fusible fleece as the stabilizer. 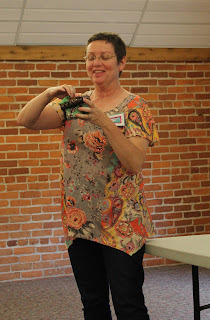 Ellen made a thread catcher from an Elizabeth Hartman tutorial on Sew Mama Sew. The weight is filled with walnut shells. It’s also her re-use challenge, as the pink fabric is made from curtains her mom made for her 30 years ago. 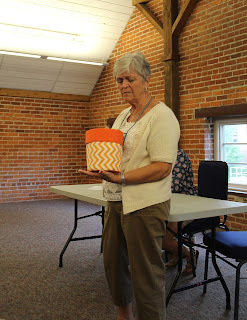 Carolyn used fusible fleece as the stabilizer and cardboard on the bottom of her container. Kathy made this basket with a Film in the Fridge free pattern. She made the smallest size, but she’s also made the largest size, and it stands up great. Ruth used a log-cabin placemat for her basket. Another upcycled project! 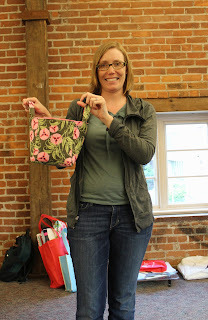 Jessica used a Noodlehead pattern to make this basket with an outside pocket and an inside divider. The handles are a burlap ribbon and Jessica added piping. Fusible web and fusible fleece were both used for stabilizers. 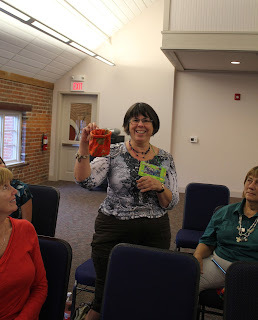 Cass's friend Barb made one box that Cass won at a silent auction. And her friend Cheryl made a sewing kit modeled after a 1940's sewing box. Amanda used the same pattern as Ellen for her box. 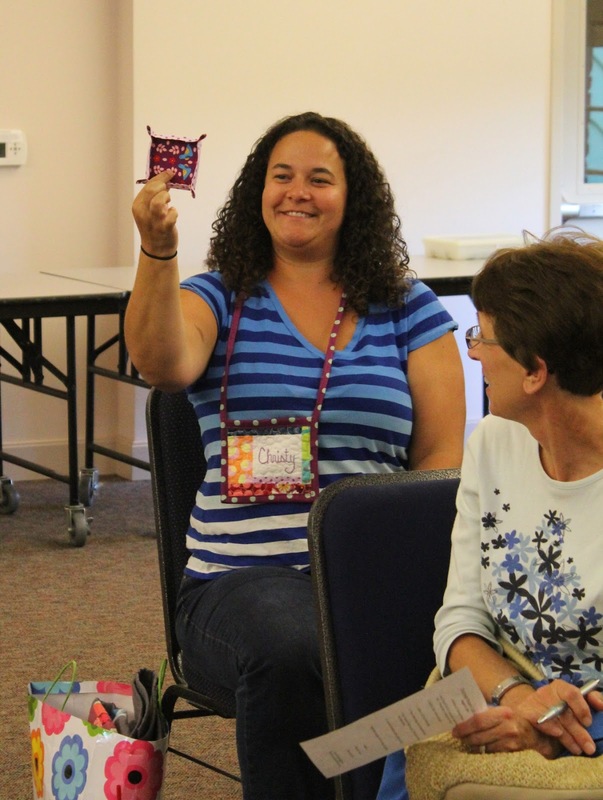 She made it to match the pincushion she received from the QuiltCon swap. Amanda didn’t use any interfacing, and the box stands nicely. New member Chris made a box with Peltex stabilizer sides held together with grommets and ribbon. Christy made a tiny fabric tray for the change in her car, using the Noodlehead design from the blog. 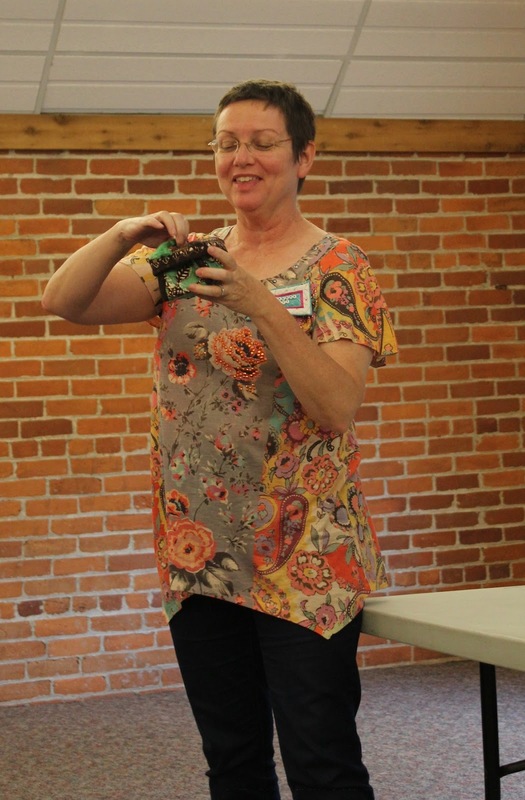 Sheila came up with her own design, using fusible batting for her stabilizer. No need to sign up at this time. Bring your own project and sew! Karen, the Marketing Director at the Barn, has invited us to contribute quilts for a show inside the Barn during the Harvest Festival. Your contribution to the show can be any modern quilt you've made in the past few years. Also, the guild will be having a vendor booth at this event. We’re asking members to donate 1 or 2 small items to sell. Popular projects in the past have been baby items, fabric boxes, softies, zippered pouches, etc. The look of the items should lean toward the modern aesthetic. All the projects are due at the October meeting. Proceeds from the sale will go toward CMQG. We’re still looking for volunteers to man our booth to promote modern quilting, especially on Thursday to set up the show. See Heather if you’re able to help out. Ideally, we’d like two people in the booth during all show hours. We’ve ordered postcards about the guild to hand out at the booth. 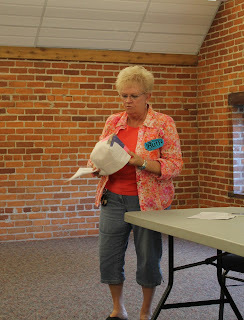 Heather will also e-mail modern quilting talking points to the volunteers. Andie is collecting quilt blocks for the quilt top we’re putting together for Quilts of Valor. Please contribute a block between 8" and 16" square, any star of your choice, in navy, red, and cream. Be sure to sign your name someplace on the block (your signature can be small). Blocks are due at the September meeting. If you would like to donate a quilt top of your own, Andie will send it to Quilts of Valor. IQF will not be returning to Cincinnati in 2014, so we will not be showing our flying geese at that show. But let’s do the challenge anyway! Keep thinking about your flying geese ideas, and we’ll work to find a place to show them. Since we’re controlling the show, there’s no size limit at this time, but that might change once we find a venue. F+W has made the business decision to cancel the Ohio Star project book. Thanks to everyone who volunteered their quilts to this project. If you have written your quilt instructions, hold on to them! We may find another project in the future, or maybe you can sell it on your own! Becca and Gwen from the Cincinnati Museum Center attended the meeting to share more information about this project. CMC has decided to create a giant (90” x 200”) Cincinnati Memory Quilt. The project information will go live to the public on September 1. The goal is to hang the quilt in Union Terminal during the holiday season in 2014. Everyone is asked to contribute 9” (8.5” finished) squares that represent your favorite Cincinnati memory. The blocks should be 100% cotton, medium weight, any color or print. Embellishments are fine. Submissions are due September 31. In addition to contributing blocks, CMQG will be meeting twice to help put the quilt together. Sew-In: We'll be sewing the blocks together on Saturday, November 16, at the Colette Gallery at Union Terminal. We'll be meeting from 10am to 5pm. Bring your own machine. Tie-In: We'll be tying the quilt during our January meeting. Wednesday, January 8, 2014, at the Museum Center in Colette Gallery. The time will be our usual meeting time, from 7pm to 9pm. Becca and Gwen will look into providing parking passes for the meetings at the Museum Center. Swap: Make a modern mug rug to swap with another guild member. What’s a mug rug? A fancy coaster. Any size—8" x 8", 5" x 7", 6" x 6"—is fine, but it should be large enough to fit a cup of coffee and a scone. Extended Show and Tell! Since we didn't get around to show and tell at the August meeting. Note: Cass will be discussing the quilt-as-you-go technique in October, to allow for the extended show and tell. The education portion of the meeting was presented by Holly on free-motion quilting. Holly used to make a quilt tops and just put them in a stack because she didn’t want to ruin them with bad stitching. 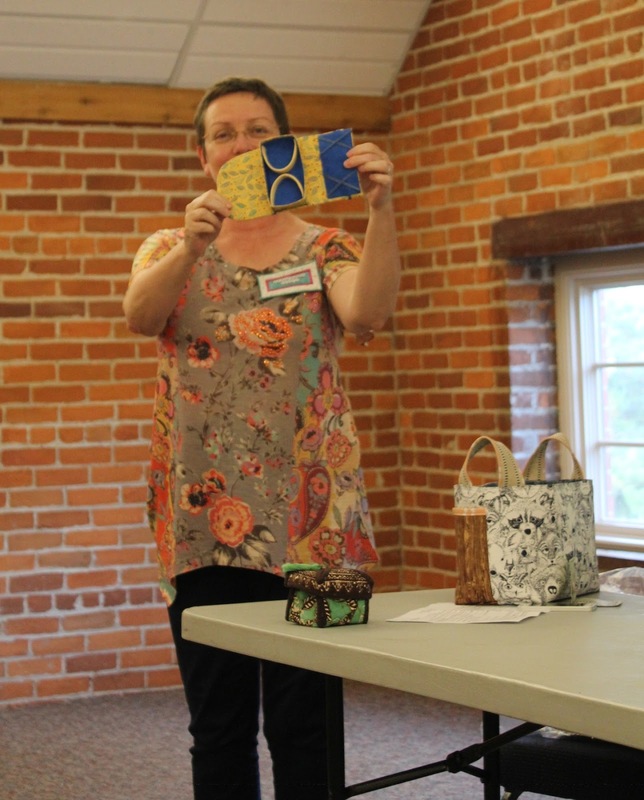 Julie Lambert inspired her with her fabulous quilting on a home machine, so Holly took a class from her. It’s OK to use a template. It’s OK to mark every single line. Free-motion quilters actually stitch over lines that they’ve already stitched, especially for grids. Holly encourages everyone to take classes, whether at a store, at a show, or even online. The instructors don’t need to be big name people, because every instructor will have tips and tricks that you’ll fine useful. 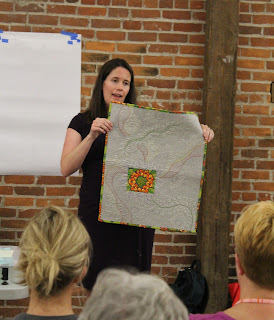 Next Holly talked through her process for free-motion quilting. 1. Find inspiration: She gets a lot of her inspiration from looking at blogs of people she admires, from books and magazines. The idea isn't to copy what others have done but to get ideas for filling a large space, for example. Machine Quilting is a great magazine to get because it includes diagrams of the steps for making a pattern. Online videos are great, too, for seeing the paths. 2. Start sketching: Once you have the inspiration, start sketching with a pencil and piece of paper. Figure out how best to put together a design. It’s like having good handwriting. It takes practice and then you get used to the movements. 3. Try the design on a practice sandwich: Next Holly tries to sew the design on a practice quilt sandwich of ugly fabric and batting. She uses these practice sandwiches to try a new thread or new pattern or to just get warmed up before she starts quilting. The more you practice the better you get at judging spaces and executing ideas, too. 4. Try the design on your quilt with tracing paper: Once you have your design, you have to figure out how to put that on your quilt. Holly lays the quilt top on floor, places tracing paper over it, and uses a felt-trip pen to sketch out possible designs right over the areas of the quilt. Rolls of tracing paper are available at art supply stores that sell drafting supplies or at Kramer’s. 5. Jump into the quilting: Holly doesn't recommend starting with anything large. Try a placement, table runner or wall hanging. They are easier to move around your machine, and it gets done quickly. She also recommends starting with an overall pattern that goes over the whole quilt, something that’s just straight lines or a stipple. 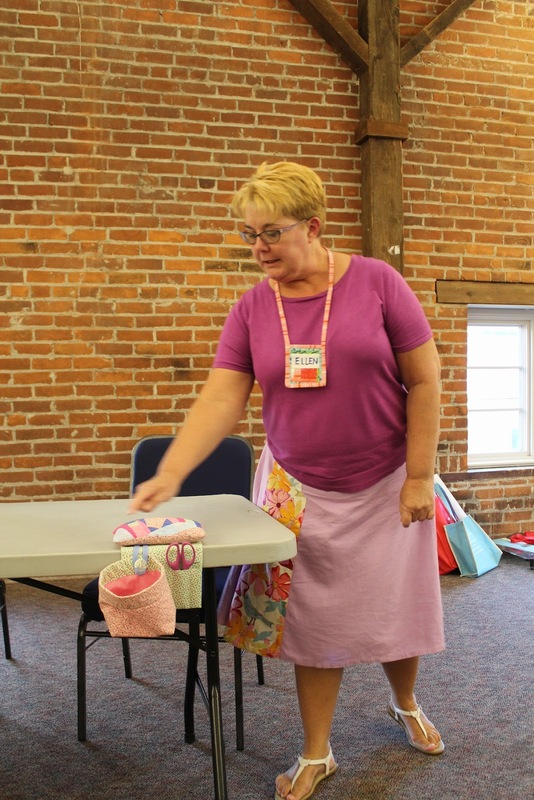 Holly still takes classes, and her most recent class was one on feathers with Irene Bloom. It was 3-4 hours of sketching only—no sewing. 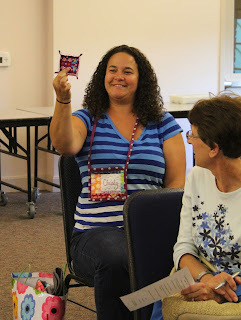 Once she got home, she made a nicer sample to get all the ideas from her class onto fabric. Her Dresden plate quilt has feathers. In this case, Holly figured out the quilting for one section of the design on tracing paper, stitched it in this section, and then traced out the next section. She didn't do any marking on this quilt. Marking pens: A blue pen with a fatter tip, for marking light fabrics, and a mechanical chalk pencil, for dark fabrics. Quilting gloves or gardening gloves for gripping the fabric and moving it around. Templates: They come in all sizes and are usually made from plastic, or you can make your own out of cardstock. Even straight line templates are handy. Taller chair: This is helpful because it's easier on your shoulders. Holly sits on two phone books to raise herself high enough for free-motion quilting. Roll up both sides of your quilt so it’s not hanging off the table, to keep your movement fluid. 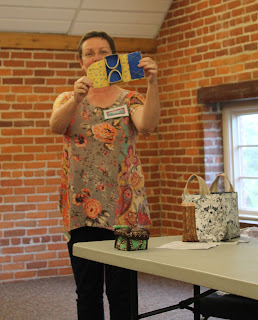 Look at your quilting as a whole other layer of your quilt. It's a way to add a different texture, a different pattern, and different colors. Give it a try, jump in, do what works best for you. You will make mistakes. Don’t try to be a perfectionist. Just learn from your mistakes and go with it!